Jordan x Paris Saint-Germain PSG 2018/19 kits for Dream League Soccer 2018, and the package includes complete with home kits, away and third. All Goalkeeper kits are also included. This kits also can use in First Touch Soccer 2015 (FTS15). According to the official statement, the Jordan brand has been increasing its presence in Paris during the last years; the opening of an exclusive store and the contract with the French Basketball Federation are some examples of this. 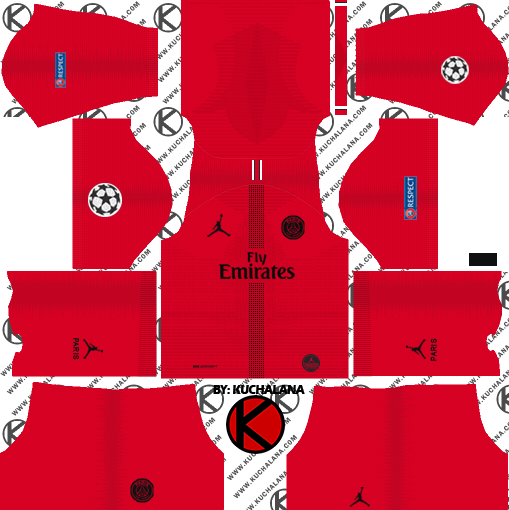 That is why the club and brand decided it was time to leave their comfort zones and launch the first collection of a football club with the Jumpman. Clothing includes everything: caps, Mercurial and PhantomVSN boots, jackets, sneakers, shirts, training clothes, pants, sweatshirts, and of course, a basketball jersey. The shirts themselves are not a thing of the other world, presenting simple designs - one black, the other white - with a dotted line in front and the shield in monochromatic version. 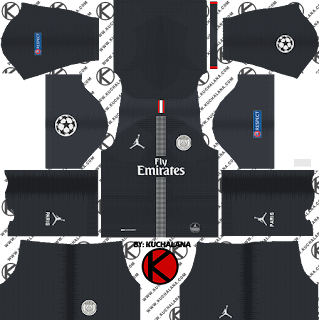 The elastic of the back of the neck of pint of red, white and black, while a "PARIS" stylized with the Jumpman can be appreciated in the interior. Officially they are the third and fourth shirts, but in principle they would only see action in the UCL. 29 Komen untuk "Jordan X Paris Saint-Germain (PSG) 2018/19 Kit - Dream League Soccer Kits"
Please league one, Bundesliga and Calcio complete kits. The Jordan and team logo are too far from the center and they are too big in size. Please fix. In the neck follow those lines can you fix it ?